CLAYTON, Alabama – June 4, 1918 – Colonel Bertram T. Clayton, a Divisional Quartermaster with the American Expeditionary Force in France, has been killed by an enemy aerial bomb, according to official notice received here by his brother, United States Judge Henry D. Clayton. Colonel Clayton was graduated from the United States Military Academy in the same class with General John J. Pershing. He saw service in the West during the Indian Wars and at the beginning of the Spanish-American War be organized Troop C of the New York Cavalry. After the Spanish-American War he was elected to Congress from the Third New York District and served one year. At the beginning of the war with Germany he was placed in charge of the transport service at New York, but on request was soon assigned to overseas service. Born at Clayton Estate, Clayton, Barbour County, Alabama, on October 19, 1862. He was a West Point classmate of John J. Pershing. He resigned from the United States Army in 1888 and was a Member of Congress from New York from 1899 to 1901. He participated in the Puerto Rico Expedition (Spanish-American War) as a Colonel, commanding the New York Volunteer Cavalry. In 1901 he rejoined the regular Army, being appointed a Captain by President Theodore Roosevelt. He served as a Quartermaster in the Philippines, 1901-04; Quartermaster and Disbursing Officer, West Point from 1911 to 1914. During World War I he was appointed a Colonel in the Quartermaster Corps on March 15, 1918; he was Quartermaster of the 1st Division in France and was the senior West Point graduate killed-in-action during World War I. He was killed at Noyer, Department of Oise, France, on May 30, 1918. He is buried in Section 3 of Arlington National Cemetery. 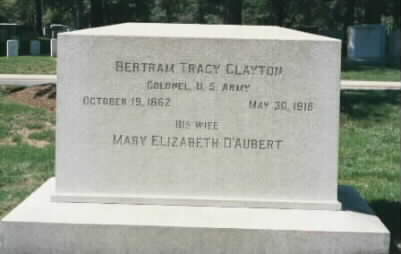 His wife, Mary Elizabeth D'Aubert Clayton is buried with him. to the Fifty-sixth Congress (March 4, 1899-March 3, 1901); unsuccessful candidate in 1900 for reelection to the Fifty-seventh Congress; appointed by President Roosevelt a captain in the United States Regular Army April 17, 1901; quartermaster in the United States Army in the Philippine Islands 1901-1904; quartermaster and disbursing officer of the United States Military Academy, West Point, N.Y., 1911-1914; during the First World War was appointed colonel in the Quartermaster Corps of the American Army March 15, 1918; quartermaster of the First Division in France; killed in action at Noyer, Department of the Oise, France, May 30, 1918; interment in Arlington National Cemetery. It has been said that the military tradition was strong in distinguished old Southern families. Perhaps no one illustrates this more than a young son who grew up in Clayton. Bertram T. Clayton's life of service to his country took him first to New York, then to the Caribbean and Asia and ended on the bloody fields of France in World War I.
Bertram Tracy Clayton was born October 19, 1862, on the family's estate at Clayton. His parents were Henry D. and Victoria Clayton. Bertram was one of 11 children. Bertram Clayton inherited a military tradition. His father, Major General Henry DeLamar Clayton, commanded a Confederate division during the Civil War and was one of Alabama's most respected soldiers. His uncle, Captain Joseph C. Clayton, was killed in the battle of Murfreesboro in December 1862. Bertram attended the University of Alabama at Tuscaloosa and in 1882 he received an appointment to the United States Military Academy at West Point. One of his classmates at "the Point" was John J. "Black Jack" Pershing, who would command U.S. forces in France in World War I. Clayton graduated as a 2nd lieutenant in 1886 and saw duty in the Dakotas with the 11th U.S. Infantry. In 1888, Bertram Clayton resigned from the Army and embarked on a career as a civil engineer in Brooklyn, New York, working with the city's municipal water system. But the outbreak of the Spanish-American War in 1898 found him back in uniform. Clayton had enlisted in the New York National Guard in 1890. During the brief war with Spain, he served in Puerto Rico as a colonel of New York Volunteer Cavalry. Politics began calling after the war, and Clayton was elected to represent his Brooklyn district in the U.S. House of Representatives from 1899 to 1901. He ran for reelection in 1900 but was defeated. So it was back to the military for Bertram Clayton. He was appointed a Captain in the U.S. Army's Quartermaster Corps and served on active duty until the outbreak of World War I. His duty assignments took him to the Philippines and the Panama Canal Zone. The United States declared war on Germany April 6, 1917, following repeated public outcries over the use of unrestricted submarine warfare against the Allied powers during World War I. Although he was a quartermaster officer whose duties kept him away from the front lines, Bertram asked to be assigned to an infantry unit to serve in France. The War Department refused to transfer him from the Quartermaster Corps, but did grant his request to be sent to France, and he shipped out to Europe in July 1917 in the second convoy of U. S. troops. Colonel Clayton was assigned to the 1st Infantry Division, the famed "Big Red One," in France. The climax of his service came during the great German offensive of May 1918, a blood-bath in which German forces hurled themselves against British and French troops exhausted by nearly four years of brutal combat. American troops checked the enemy in bloody fighting at Chateau-Thierry and Belleau Wood. Clayton was killed in action during a German air strike at Noyer, Department of Oise, on May 30, 1918. The 55-year-old Alabamian was one of the first American officers to die in an air assault. He was the highest-ranking West Point graduate killed in action in World War I. The colonel's body was laid to rest in Arlington National Cemetery. Among the pallbearers was General John J. Pershing, his old classmate from West Point, along with two major generals and several colonels. His wife, Mary Elizabeth D'Aubert Clayton, who died in 1922, is also buried there. Bertram Clayton seemed unable to escape his military destiny. He saw duty in four U.S. wars: the Indian Wars, the Spanish-American War, the Philippine Insurrection, and World War I. The Montgomery Advertiser of June 5, 1918, described him as "every inch a soldier." After World War I, the Alabama Department of Archives and History began placing names on the Gold Star Collection as a tribute to Alabamians who paid the ultimate sacrifice in the "war to end all wars." Colonel Bertram T. Clayton's name is among them.